Life is often stressful. With so much on your schedule, it can be hard to find the time to get away from it all. Here at Pirate Airworks, we’re proud to offer you the perfect opportunity to escape. 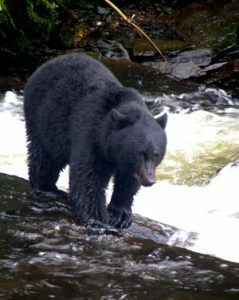 We offer Misty Fjords trips in Ketchikan, AK, bear-viewing tours, and a wide range of other flightseeing opportunities. When you fly with us, you’ll enjoy an experience unlike any other, as our expert pilots take you on the trip of a lifetime. Soar over unforgettable sights, as you take in the gorgeous landscape of Alaska from the comfort of our safe, well-maintained planes. 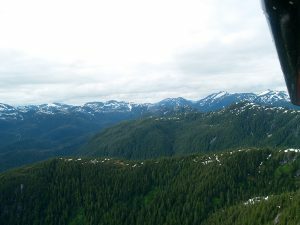 Enjoy Ketchikan flightseeing, trips over national forests, and much more when you fly with us. Serving Ketchikan for over 35 years, our highly experienced company service offers the best tours on the waterfront in Alaska. Our customers appreciate our dedication to ensuring that they have a great time on all of our trips. Please take a few minutes to read some of our customer testimonials. We offer tours of national parks, bear-viewing trips, and more. Our Misty Fjords Tour is our most popular! The Misty Fjords (Misty Fiords) National Monument is a 2.2 million-acre park, which was carved by glaciers some 10,000 years ago. During our 1 hour, 30-minute tours upon one of our floatplanes, you will see a myriad of crystal clear alpine lakes gouged out by those very glaciers. Saltwater fjords surrounded by sheer granite walls are alive with waterfalls cascading down thousands of feet. Halfway through the tour, we will land within the Monument for a stopover. This gives you time to stretch your legs, take some pictures, and breathe in some of the purest air on the planet. Unbelievable scenery will surround you. This may be one of the most peaceful and breathtaking times of your life. This trip will be a memory you will long remember. As a bonus during this flight, you will be able to use headsets. These give you the opportunity for our pilot to talk about the highlights of the tour and also play some quiet music in the background. No boring pre-recorded tape will explain what you are seeing in that irritating monotone voice! Our pilot will be your personal tour guide throughout this amazing experience. He can answer your questions while sharing with you his beautiful home in Southeast Alaska. Misty Fjords National Monument, our most popular tour, lasts 1.5 hours and takes you across Revillagegedo Island over to the Alaska mainland where the fjords are located, and into the heart of the monument. Headsets are provided to passengers so the pilot can narrate and point out some of the beautiful sights. For the highlight of the tour, we will land on a calm bay at sea level so you can take in the scenery from sea level as you drink in the silence of the vast wilderness. Flying within the Misty Fjords is truly an emotional experience you'll never forget! Call for special family rates, group rates, monthly specials and to check availability. How about a city tour by air! This is a wonderful short tour of our city! 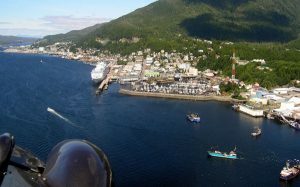 This town and harbor tour is sure to give you the best aerial view of our wonderful city, the alpine scenery of Ketchikan’s Lakes, both totem pole parks and what we call a mini-misty. This trip is great if you want to experience a seaplane for the first time or if you don't have much time in port. Enjoy great photo opportunities of your cruise ship from the air above. This tour is an extension of our standard Misty Trip and adds an additional 30 minutes or so of flight time and some additional time on the water as we drift as close to the bears as we can get for some good photo opportunities. Alaska's Inside Passage in Southeast Alaska is home to some of the most breathtaking scenery on earth. One of its jewels is the majestic Misty Fjords National Monument. Completely roadless and consisting of 2.3 million acres, an area larger than Yellowstone, makes a seaplane tour the only way to comfortably experience the many different levels within the deep, narrow fjords. Carved by glaciers long ago, snowcapped, sheer granite cliffs rise dramatically 3,500 out of the sea, ribboned with waterfalls sensationally plummeting thousands of feet. Nestled within the steep walled canyons are pristine, bowl-shaped alpine lakes suspended at many different elevations above sea level. 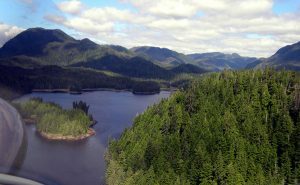 Fed by more than 150 inches of misty rain annually, the lush rainforest, made of giant stands of spruce, hemlock, and cedar, cling to the rugged rising terrain. Wildlife abounds in the area, with mountain goats and harbor seals being the most frequently sighted animals. Misty Fjords National Monument, our most popular tour, lasts 1.5 hours and takes you across Revillagegedo Island over to the Alaska mainland where the fiords are located, and into the heart of the monument. Headsets are provided to passengers so the pilot can narrate and point out some of the beautiful sights. For the highlight of the tour, we will land on a calm bay at sea level so you can take in the scenery from sea level as you drink in the silence of the vast wilderness. Flying within the Misty Fiords is truly an emotional experience you'll never forget! Contact us today to learn more about our national forest trips. Call for special family rates, group rates, monthly specials, and to check availability. The Glacier Fiords tour is an extension to our regular Misty Fjords tours. The flight portion is an additional 30 to 40 minutes, as we continue past the saltwater fjords up one of the many lush river valleys to the glaciers that remain from the last glacial age. We will fly over the face of a glacier and on up the river of ice above the massive ice field. This 2.5 hour tour will also include the same landing as described in the Misty Fiords tour. 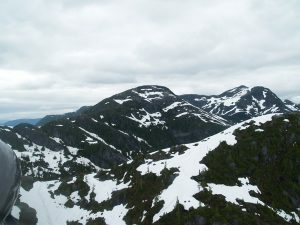 Occasionally, due to lower cloud heights, the glaciers are not visible. In that event, we would only fly the Misty Fjords portion of the trip, and the price would be changed accordingly. Tour Includes: 1: 45-hour flight and approximately 35-minute stopover. Contact us in Ketchikan, AK, to learn more about our amazing tours. We look forward to hearing from you.